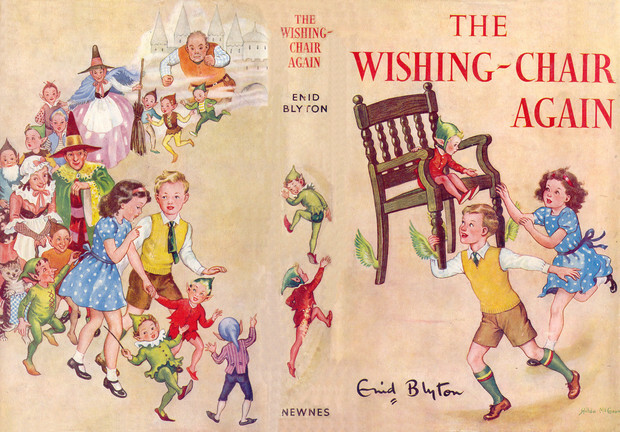 Out of the two Wishing Chair books I owned as a child, I always preferred the second – The Wishing Chair Again (published in 1950) – because the adventures were longer and seemed more interesting. It also introduced the character Winks the brownie, whose sheer naughtiness led them into some very unusual situations. So I was delighted to find this book in my husband’s childhood book collection and wrote this rather-long review (I just really enjoy this book!). It starts with Mollie and Peter coming home for the holidays and wondering where Chinky and the Wishing Chair are, as they can’t be found in their playroom at the bottom of the garden. Chinky has been looking after the chair while they’re at school and since he couldn’t get into the playroom because the door was locked, he had to keep hiding it in the garden all morning! In the first book the initial adventure is quite short, but this time they end up on a much longer first adventure (starting in the second chapter) when Peter tells the chair to take them to “Goodness Knows Where” – apparently it’s a real place – but the chair first takes them along a moonpath and then to Chinky’s cousin Sleep-Alone. From here, they go to consult Goodness and then find the chair has been stolen, so they have to spend a couple of chapters first getting home and then finding their chair in Pin Village. But life’s never that simple and after a goblin called Tricky gets to it first, it takes until the end of chapter six before they finally have their chair back. This is, of course, only the first adventure of many, with the chair taking them to the Village of the Slipperies and having its wings cut off. The growing ointment they get to solve this problem soon leads to another when the children use it to make their toys and Chinky’s wand grow wings and they take off for Toyland. The children and Chinky set off after them and find that the toys have ended up at Mister Grim’s School for Bad Brownies! This is where they meet Winks and Mister Grim, who appears to be the male version of Dame Slap from the Faraway Tree as he asks ridiculous questions – if he takes 52 hairs from his floor-length beard, how many will be left? – and deals out strokes with a stick for punishment. The stick is actually Chinky’s wand and the pixie soon devises a plan to get it back and use it to escape, so they can lead an army of toys to the school (led by a Golliwog – I’ve got one of the older versions that hasn’t been changed) to rescue the toys belonging to Mollie and Peter. The children and Chinky rescue Winks at the same time and the brownie simply can’t stay out of trouble. There’s a visit to the Land of Goodies (one of my favourites from the Faraway Tree books), with delicious-sounding jam tart flowers, a ginger-beer stream and ice-cream growing on another plant in the cool valley. Winks first orders red pepper soup to be funny and then starts breaking and eating someone’s house, so he’s left behind and has to find his own way out of the chocolate cake prison. The brownie is some help when Chinky and the chair disappear while the children are at the seaside – apart from dyeing his hands blue when they go to Mr Spells for help – but soon afterwards he steals a wand from Witch Wendle and turns Chinky into a puff of smoke. He in turn becomes a horrid smell as Chinky cast a spell with his own wand at the same time and the children have to go to Witch Wendle to find out how to get them back. Witch Wendle says that the still smelly Winks really has to go back to school, but Mollie pleads for him to stay until she and Peter have to go back to boarding school. On their last day of holidays they make another attempt to get to the Land of Goodness Knows Where before deciding to land on Island of Surprises instead. Like the last land at the end of each Faraway Tree book, the Island provides them with mostly nice surprises, like the car race and the ice-cream fountain. Winks tries to misbehave several times, but here the magic punishes him for being greedy or naughty and when he finally manages to annoy a witch, he’s sent back to Mister Grim then and there. 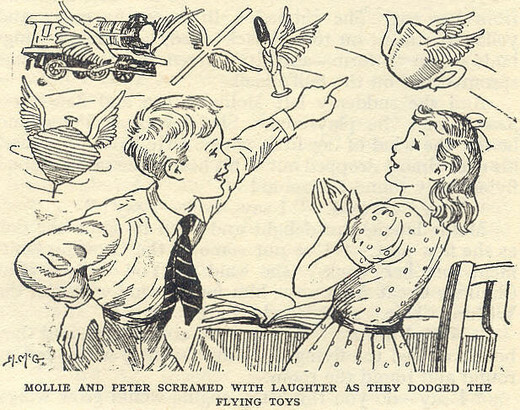 Peter feels sorry for him and gives him the Tidbit Dish that he won in the car race, so he’ll get enough to eat at school – every time you lift the lid there’s a tidbit there, like a sausage or a bar of chocolate. Winks is sent off on a swan and the children and Chinky have to leave too, as the Island of Surprises always disappears at sunset. This entry was posted in Book reviews and tagged The Wishing Chair, The Wishing Chair Again, Written by Laura. Bookmark the permalink. Excellent review – much appreciated.